Posted on February 6, 2008 by Chad O. 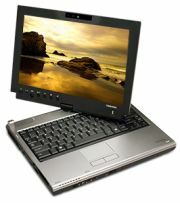 Some high resolution pictures of the Toshiba Portege M700 have been posted by Matt Faulkner over at GottaBeMobile. If you are thinking about Toshiba’s 12″ convertible Tablet PC, and you don’t have access to one in person, you should head over and check out the photos. Of particular interest is the Portege M700’s swivel/hinge. Hopefully they’ll post more of the LED-backlit display (unless I just missed them, which is entirely possible).